This caps off a fantastic year for the band with triumphant shows at the Reading & Leeds festivals, Glastonbury, Bestival, Download as well as a sold out UK tour earlier in the year to mark the release of their third album, Punk & Poetry. 2011 will also be remembered as the year that continental Europe embraced The King Blues with a raft of festival appearances being followed up by a 17 date European tour throughout October. Norfolk based Deaf Havana are on tour promoting their brand new album ‘Fools and Worthless Liars’ as well as releasing a video for the bands latest single ‘I’m A Bore, Mostly’..
MALEFICE, are currently readying to unveil Awaken The Tides, the third full-length from one of the most exciting modern metal acts to come out of the U.K.
Set for release in Europe on July 15, the UK July 18 and North American on August 2 via Metal Blade Records, the 10-track long player was recorded at The Face studios in Reading with drums laid down at Fortress Studios in London. All tracks were mixed and mastered by Justin Hill. 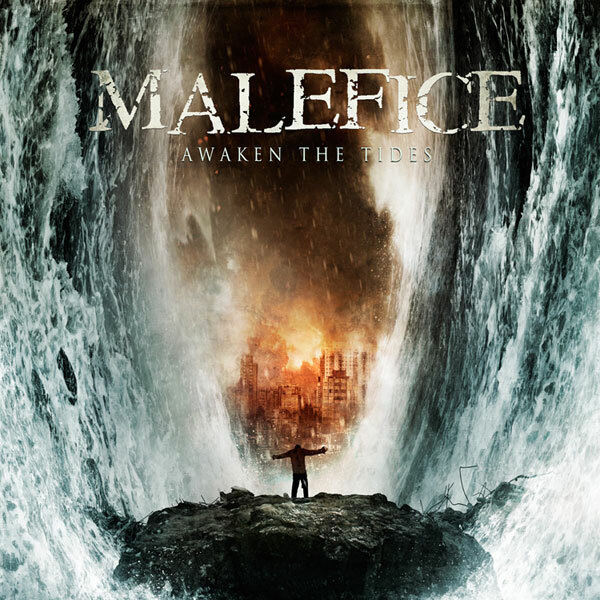 In other news, MALEFICE have announced an intimate home town warm-up show prior to their appearance at Download 2011. They’ll play Sub89 in Reading on Wednesday June 8, 2011. Watch out for more dates, preorders, and the first single, all coming soon! Dr Lester Grinspoon, Associate Professor Emeritus of Psychiatry at Harvard Medical School has much to answer for, as it was he who first highlighted the positive medicinal uses of Marijuana. He also lent his expert knowledge during the trial on the deportation of a certain Mr John Lennon, and latterly, on the naming of Australia’s foremost rock band, GRINSPOON. GLOBAL MUSIC are proud to announce the official, full-European release of the album, ‘SIX TO MIDNIGHT’, from multi-platinum-selling, Australian rock-group GRINSPOON. The record will be available from July 4th 2011 via DR2 Records. ‘SIX TO MIDNIGHT’, has already gone GOLD in Australia, and this special European version will feature five additional bonus tracks, including a reworking of their classic anthem ‘Champion’, produced by Rick Will (Incubus / Skindred). As well as recently completing a successful UK tour with TWO sell-out London shows, GRINSPOON were also invited as special guests on Stone Temple Pilots’ first ever Australian arena tour back in March 2011. Other past stadium supports include Creed, Lit, Godsmack and Anthrax, as well as an epic appearance at the closing ceremony of Australia’s 2006 Common Wealth Games in Melbourne. GRINSPOON are a band who have been through all the thrills and addictions of a rock group; sixteen years together, and still performing every show like it’s their last on earth, with their collective experiences lending to the writing of some amazingly heartfelt music. Starting today, the popular metal portal MetalSucks <http://www.metalsucks.net/2011/05/25/job-for-a-cowboy-gloom/> is hosting the worldwide exclusive premiere of the upcoming JOB FOR A COWBOY (JFAC) EP Gloom. The Gloom EP will be available digitally and physically via mail-order only on June 7th. Fans wanting a physical copy of the Gloom EP should act quickly, though, as it is a limited edition run of only 2,500 copies. The EP features four new tracks of fine-tuned, visceral death metal featuring the re-invigorated lineup of Jonny Davy, Jon “Charn” Rice, Al Glassman and new guitarist Tony Sannicandro. The Gloom EP cover features new artwork from Ruination artist Brent Elliott White <http://brentelliottwhite.com/home.html> . Listen to Gloom now HERE <http://www.metalsucks.net/2011/05/25/job-for-a-cowboy-gloom/> . I AM ABOMINATION is pleased to announce the upcoming release of their brand new digital EP, Passion Of The Heist, on July 19th, 2011. The digital EP is being released by GOOD FIGHT MUSIC, the same label that released I AM ABOMINATION’s first critically acclaimed full-length album, To Our Forefathers. A new single from the digital EP will be released via the band’s official Facebook page http://www.facebook.com/IAmAbominationMusic on June 8th. Stay tuned for further announcements about this debut. Passion Of The Heist is described by the band as a concept album, and was produced, written, engineered, mixed and mastered by guitarist Nick Sampson. The EP was also recorded at Nick Sampson’s studio in New Boston, MI. All lyrics on Passion Of The Heist were written by Brandon Good. The band plans on releasing new information about the concept of the EP with the release of the new single. Passion Of The Heist includes guest appearances, including an appearance by ATTACK ATTACK’s Caleb Shomo on the track ‘Ascension’. Set to Support Veil of Maya on Brief Summer Tour, Including Hometown Dates in Indiana! Indianapolis, Indiana’s prog-metal prodigies THE CONTORTIONIST have just announced brand new co-headlining tour dates on the SLAUGHTER SURVIVORS TOUR with Conducting From The Grave, Scale The Summit, Rings Of Saturn, Volumes, and Structures. The tour begins with a kick-off party in Hollywood, CA at the Key Club on July 21st. See below for all current tour dates. The band recently announced tour dates with Veil of Maya to their summer touring schedule. The short run will take the guys through Illinois and Indiana on four dates in June. As mentioned above, the band is native to Indianapolis, IN and seldom performs live in the area, so this tour serves as an excellent and rare opportunity to witness the band in their hometown! THE CONTORTIONIST released their debut full-length, Exoplanet, with GOOD FIGHT MUSIC on August 31st, 2010. Their infectious, progressive and rhythmic sounds have brought them comparisons to some of today’s metal greats, such as Meshuggah, The Acacia Strain, and Between the Buried and Me. SHAI HULUD have announced they will be touring Europe in June 2011 including five UK dates. SHAI HULUD released ‘Misanthropy Pure’ on Metal Blade Records in 2008.